You deserve a licking if you’re not a fan of today’s food holiday. July 20 is National Lollipop Day! This is also the first post we are scheduling to publish. (Remember, we write the majority of these ahead of time)! We’ve gotta do it this way since we’re camping this weekend and Internet service is hard to come by in the wilderness. Besides, we’re too busy making S’mores and keeping raccoons away from our food in order to worry about blog posts this weekend, so we’re happy to let Technology do her thing. Yes, technology is a she, in case you were wondering. It’s also National Fortune Cookie Day, but Confucius say no lookie for cookie in middle of forest. So, lollipops it is! A man named George Smith, owner of the Bradley Smith Company – who manufactured candy and other sweet confections – claimed to have invented the modern lollipop in 1908, putting candy on a stick to make it easier to eat. He named the treat after his favorite racehorse, Lolly Pop, and trademarked the name. But lollipops have probably been around in one form or another for as long as man has roamed the earth. Prehistoric dudes are believed to have scooped honey from beehives using sticks, and licking them so as not to let any of the sweet nectar go to waste. Archaeologists have found evidence that ancient Chinese, Arabs, and Egyptians all made candied fruit and nut concoctions that were served on a stick to make them easier to eat. In the 17th century the English enjoyed soft boiled sugar candies that they placed on sticks for easier eating. Though the candy wasn’t hard, the concept is pretty much the same. During the Civil War children were given hard candies on the tips of pencils as treats. So at best, Smith reinvented something that had been around since the dawn of man. Nice try, George. He allowed his trademark to expire during the Depression, when people were too busy trying to put scraps of food on the table to enjoy a treat like a lollipop, and the name fell into the public domain. To celebrate, we bought a bag of Dum Dums and enjoyed lollipops around the campfire. 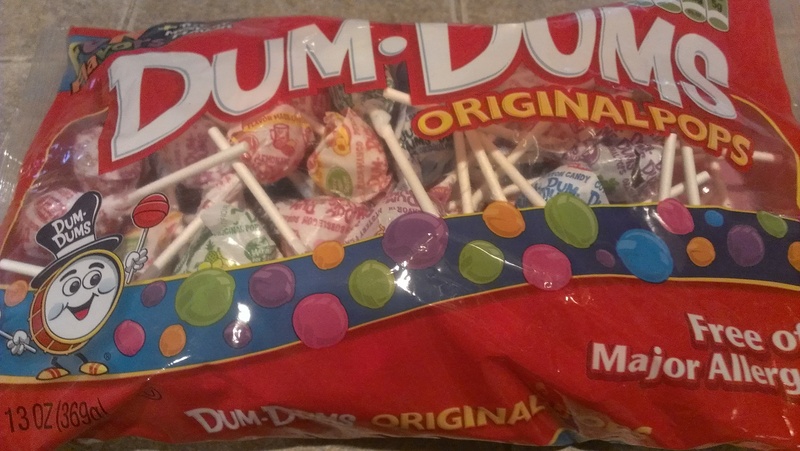 I had dum dums too! It was either that or Tootsie Roll pops, but I’m not a big fan of Tootsie Rolls. How did I miss that obvious retort in my blog post?? Ha!